As you may or may not know, my grandfather was a tail gunner on a B-17 Flying Fortress in the ETO (European Theater of Operations) during World War II. Recently I’ve been scanning his photos and documents for posterity, in hopes of putting them online in some fashion. For now, here’s a shot of the crew of Out House Mouse (#42-31636, OR-N) – my grandfather is the tall guy third from the left, in the back row. For more about Out House Mouse, read the bottom of this page. The picture of OUTHOUSE MOUSE came out great. You’ve obviously been looking at the internet and found some things. I’ll send you some web sites that you’ll be interested in. Great stuff. Love reading about heroes of the past!! My father Quentin was also the tail gunner on the Mouse in late 1943 thru early 1944. He flew a total of 25 combat missions. My father was the LAST assigned pilot to the Outhouse Mouse. He was in the ETO from Jan 1945 to the end of the war in Europe. 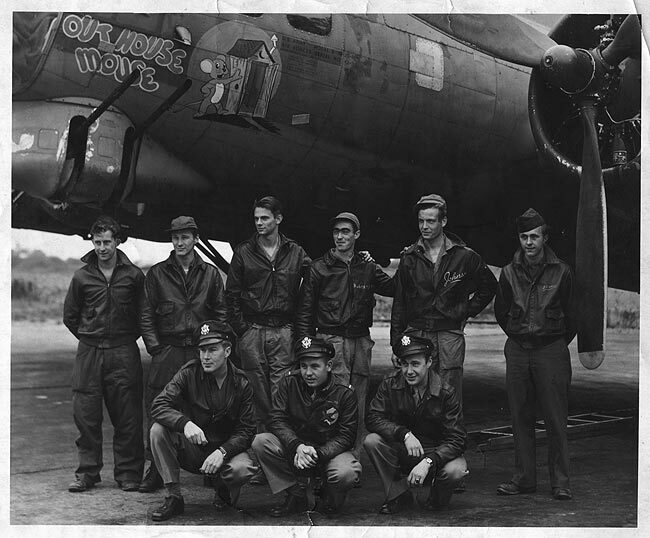 I have collected all the available war diaries of his crew (9-men) and compiled them in a book called “Memories From the Outhouse Mouse – The Personal Diaries of One B-17 Crew”. I mention this only as a point of interest and because this is the first photo I have seen with a crew OTHER THAN my fathers. Because OHM had 139 missions, I figure there were 3 or maybe 4 different assigned crews over the course of the war. From this e-thread, I see perhaps two of the others – one whose grandfather is in the photo and the other whose dad is “Quinton”. I’m very interested in contacting each of you. I have all 25 of the flight reports for the tour my father did, and the crew was pretty consistant. Camerucci must have been wounded or ill for about 7 weeks in early January and February 1943, as he was the only crew member that shows a substitute during the times these flight reports cover. According to the records I have, there were a few times this crew used another aircraft serial number- I assume due to the OHM being out of service. Anyone know any of these guys or if they are still with us? Co-pilot Wilfred Hobin, although always called and goes by Mike, is my uncle. He is in outstanding health even though he’ll be 91 this summer. Although raised in New Jersey, Mike has lived for the past 15 or more in Bradenton, FL. My Grandfather Walter M. (Lindy) Limberger was a tailgunner on the OHM. My Mom has the book that Robert Harvey wrote about the crew. He even autographed it for us! I’m very pleased that I can find information on this topic. April 2007, co-pilot Wilfred Hobin, generally known as Mike Hobin, is still alive and in excellent health still living in Bradenton, FL. Last month, June 2008, he turned 92. In conversations with him, he told me that he had had some contact with bombardier, Raymond Byrne, who had been living in Fayetteville, NC. However, have no idea how current that info is now. Jd hatfield, that is my grandfather. Do you have any photos or anything? Could i get a copy of this photo? Mr. Harvey -I would like to be in touch with you regarding any information you might want to share regarding the Outhouse Mouse. My Dad (SSGT Laurent W. Lamy) served with your dad on the B-17 in Jan. 1945. Please contact me if you wouldn’t mind. Dad passed last year in Jan. 2009 – This coming week I will be attending the funeral of SSGT Zaven Kaprielian in Massachusetts. I was in touch with his son recently, and was invited to attend. He has a few photos to share, and I also. My brother Milton E Hensen is the Middle guy in the front of the plane. anyone have information about this crew? My father,Bruce j Johnson,is the man standing fifth from the left in the back row. He was a tail gunner. I have that same photo at home! My Grandfather is David Camerucci he’s 1st man on the right, I don’t know all the history of his tour but I’am really intrigued now. I would like to get the book by Robert Harvey that mentions this crew. David Camerucci past away in 1996 he was 74. My father, Paul Katz, was navigator on OHM with Captain Harvey. We also have an autographed copy of the book Robert Harvey wrote. I may be able to find a picture of the crew with OHM if you would like me to send it here. Terry I just ran across this Blog and saw your Post. My dad was Ish he died back in 2002. He talked about running around with your dad during the war. I haven’t been able to find much of his stuff from the war . Would like very much if you could send me a copy of your dad’s flight reports. The South High School in Grand Rapids, MI. purchased a B-17 (42-29577) in 1943. She was a trainer out of Columbus Ohio. Wilfred M. Hobin was on a navigation flight to GA. and return in Oct. 1943. She ran out of gas and crashed at Medows of Dan VA. all hands safely bailed. Please contact me with any information you have on Mr. Hobin. One of my classmates is writing a book about this incident. Joe Rogers – Grand Rapids, MI. My father was Ray Hobin. He died in January of 2013. Mike Hobin is my uncle and is 99 and still living in Bradenton, FL. If you would send me your email address I can get contact info to you. Where can I request the flight logs for the outhouse mouse? My uncle Milton Hensen is the Lt. on the middle. He was never the same after flying 39 combat missions. After being asked I assume to be a flight instructor, he was diagnosed with “Old Occupation Fatigue, now known as PTSD. If anyone has any more info on the crew or missions, reports etc, please post them. I’ve just received his file and am waiting for his Medals. He flew during the fall of 44.
the outhouse mouse in 1944, my brother Milton Hensen Jr was the co pilot.